Hey friends! Guess who's back? Yep, me. 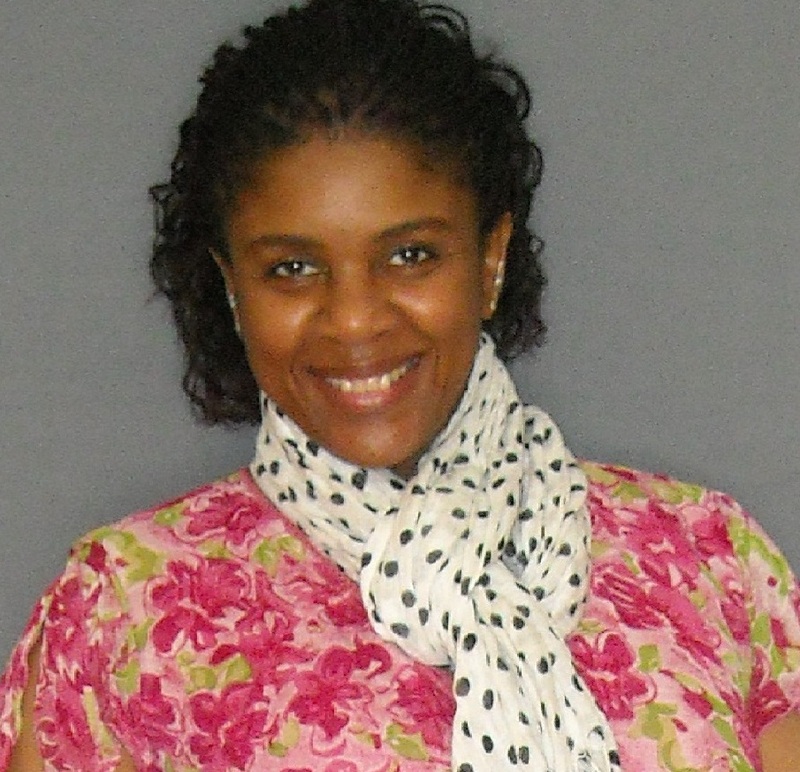 While my blog has been in a winter hibernation, I haven't. I've actually been getting some stuff done like redecorating the house, sewing, catching up on some reading (professional and pleasure) and visiting a few blogs unrelated to fashion/thrifting. I know there's no way I can go back to each and everyone's blog and catch up on the last three months. That would take me until mid-summer to do. So I'm counting you all to give me the highlights of your blog/lives in the comments you leave. I want ALL the details on romances, children, fabulous thrift finds, fashion hits and misses, vacations and the like. Guess who else is back? Look at the Tommy Hilfiger ad above for a big hint? That's right. The older couple that had mysteriously gone missing a few seasons ago. I mentioned it here last fall. I'd like to think that somebody over at Hilfiger Inc. read my post and broached the subject in one of their board meetings. I'd like to think that person said, "Hey, why don't we bring back the old mature couple for our spring/summer 2013 campaign?". I'd like to think that person got a promotion and a whopping pay raise for my such a brilliant idea. All I have to say is, whoever you are, you owe me big time! But I'll settle for a salted caramel hot chocolate (with extra whip cream) from Starbucks, and we'll just keep it between ourselves. Great to be back y'all. I'll be getting around to visit you over the next week. 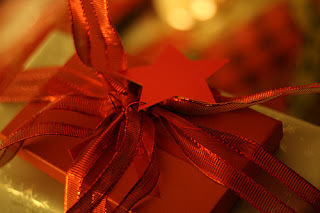 We're all familiar with the saying "Tis better to give than to receive". Bull Pucky! Don't believe the hype. Receiving is great fun. I participated in a gift swap among other bloggers this year and the rules were that 4-5 gifts were to be given. One had to be handmade and the others had to be second hand. My swap partner was Tami V. of Thrift Shop Commando. She sent me all sorts of fabulous stuff. I especially adore the purse and the fur trimmed leather gloves. Thanks Tami! If you like vintage stuff and images from the 1950's, 60's and 70's, then make it a point to stop by Tami's. This next give came completely out of the blue. Jean of Dross Into Gold emailed me to let me know she had a pair of Franco Sarto burgundy booties she thought I might like. I swear on the Girl Scouts honor that just that very day, I had been wishing for a pair burgundy booties. What a gift. Thank you Jean. You're one of the most thoughtful bloggers I know. Some of the gifts we receive aren't wrapped nor are they purchased; things like the gift of time. Well, did you know you can also be given the gift of s p a c e? Yep it's true. Earlier this year, my husband called me while I was out and about. He told me he had a surprise for me. When I got home, he walked me into our my closet. The small space where his clothes used to hang was empty. 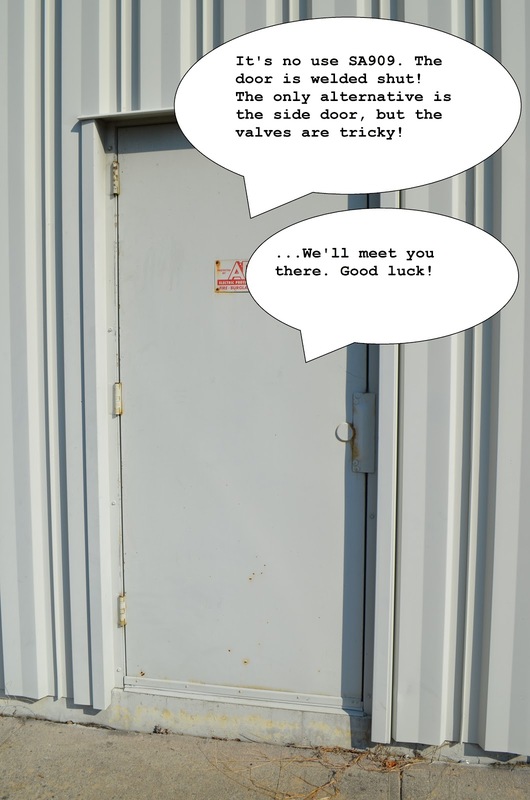 He had moved his meager clothing collection to the coat closet so that I could have the entire walk-in closet to myself. I feel selfish just just talking about it. Needless to say, the space was completely filled in about two days. It was a wonderful gift and I think about it every day I go in there. Thank you My Love. I hope you've all gotten some lovely gifts this year and not necessarily new ones or the ones you get at Christmas or on birthdays because the truly great ones are unexpected and given with love and thoughtfulness. Yes, tis a great thing to receive! Have you ever read the first few pages of a magazine? No, I'm not talking about the Gucci and Guess ads or even the table of contents (which I can never find). I'm talking about the page where it list everyone who had a hand in making the magazine come together. It's a long list and there's an 'assistant' to everything. The assistants even have assistants. Think about this: your blog is kind of like a magazine. It's entertaining, has lovey photos and creative writing. People look forward to receiving it. More than likely it's a one woman show. That means you're the editor-in-chief, the copy editor, creative director, photographer (usually), social media director, in charge of make-up, wardrobe and public relations. If you've decided monetized your blog, well, that also makes you marketing director too. Oh! Did I mention you also have a full time job, children, significant other and/or pets to care for as well has run a household? Minor details. Do I even need to tell you how incredible you are? Of course not. You already know it, so give yourself a pat on the back, take a bow in front of the mirror (or if you're like me) buy yourself a new pair of shoes! This editor-in-chief, photographer, director of wardrobe has been super busy with her J.O.B. and hasn't had a lot of time for public relations, i.e, visiting other blogs and the position of creative director is seemingly vacant. None the less, expect publication to resume after the Thanksgiving holiday. I'm curious to experiment and get your opinions on winter pastels, winter brights and winter whites. Has anybody played around with those yet? In the meantime, just recall my opening words: You're incredible! No folks, it's not Christmas just yet, but I was getting a feeling of comfort and joy from this outfit. Comfort from this old denim shirt that has just the perfect amount of wear and softness plus a couple of holes in just the right places (thrifted that way) and also from the fact that there wasn't a single thing that was pulling, tugging, riding up, sagging down, rubbing, poking, itching, sratching or restricting about any of these garments. Nope, not a single thing; not even an irritating tag (because I cut them out). The "joy" part of this outfit, well that came from the polka dots, because everybody knows polka dots = joy. I wore this a couple weeks back (before the weather got real cold) when I took my dear mother-in-law out to lunch and shopping. We always have a fun time on these little outings. She's full of life stories and at 84 she's still a fashionable lady, so shopping is quite an adventure with her. I tell you friends, it's great when you have in-laws that you like and vice - versa. I equate it with polka dots... a pure joy. 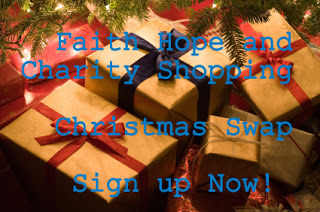 The holidays are fast approaching and things are about to get real hectic for some of us. So, I'll take this opportunity to wish you all the comfort and joy in the world, if not from your in-laws and other relatives, then at least from the clothes you grace your body with. Do you anticipate spending the holidays with in-laws or out-laws? Liz Claiborne denim shirt: thrifted also worn here and here. Fly London booties: via Saxon Shoes. Sooo comfy! 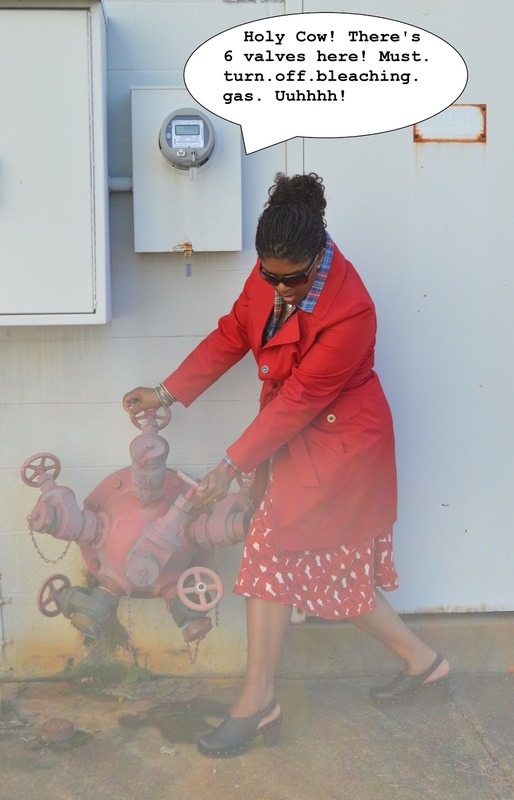 I'm linking up with Patti's Visible Monday. Come join me. What a confusing title. But it'll all come together in the end. Today I'm linking up with Marionberry for her Trend of the Month party which is all about boots and booties. Perfect timing for me because I just got these Fly London booties that I'm sooo loving! I haven't been this happy with a pair of shoes in...in three weeks! Now, when I first became familiar with this brand I assumed because of the name (Fly London) they were made in the U.K., wrong. They're made in China. But I assure you they don't feel or look cheap in person. Even the box they came in looks like quality. I'm seriously considering framing the top. So far I've only worn these booties for weekend wear. I'd love to sport them to the J.O.B. but not sure how to make it work; Any ideas? Speaking of weekend wear, you might be wondering where I wore this outfit to. Well, there's a reason I'm dressed military style. I was at an auction and in full commando mode. Wait 'til you see what I got... stay tuned. Meanwhile, if you've got a thing for boots, drop on by Marionberry's to check out a whole slew of 'em. Better yet, link up and show off a pair of your own. Happy Halloween folks. Hope you all are going to do some fun stuff tonight! Can't wait to get around to everybody's blogs to see what they've cooked up for costumes. Ally's having a Halloween party, so that's where I'll be. Swing by and join the fun. About my costume, well, it's only a costume in my imagination. You see, when I thrifted this sweater dress a few months back I thought it would be a way of taking the maxi dress look into fall/winter. Then I read an article tilted "A common Bond" in InStyle magazine featuring all the Bond girls over the years (minus Halley Berry! More on that in another post) and I then the light bulb came on in my head. I bet a Bond Girl would wear a long black sweater dress like mine. All sorts of weapons could be hidden under it! So there you have it. I'm a Bond girl. O.K. so it might be a stretch, but it was either this or one of those t-shirts that says "BOO". Happy Halloween! Remember to drop by Ally's today... or the next. Ambassador X along with two of her cohorts have been held against their will by Rupert Retail and his henchmen in an abandoned warehouse. Her special thrifting powers have been reduced to fatally low levels because she's been deprived of seeing the color red for months. 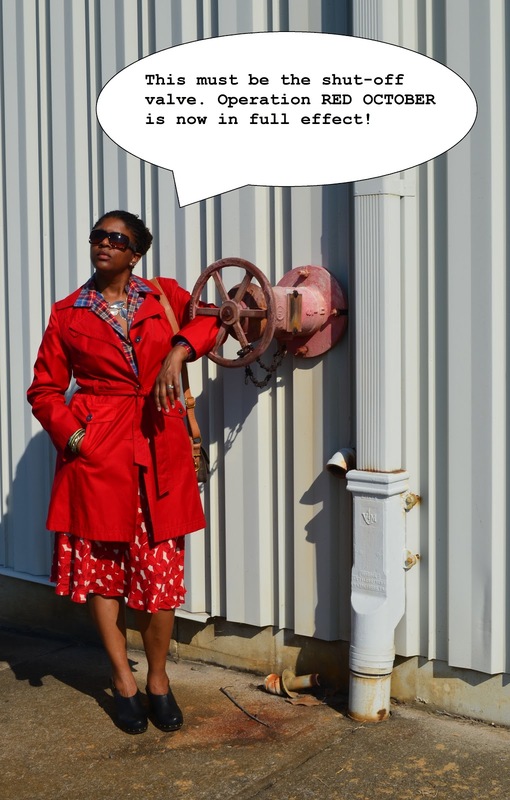 My mission: To infiltrate the building undetected and allow Ambassador X to see my outfit in all it's red glory to restore her mega thrifting powers. The fact that it's mixed prints and mostly thrifted will only maximize the effect. I must hurry and locate the shut-off valve. The effects of the spiked frozen yogurt I gave the guard will wear off in mere minutes! I really hope the Ambassador likes my outfit. I kind of put it together at the last minute. 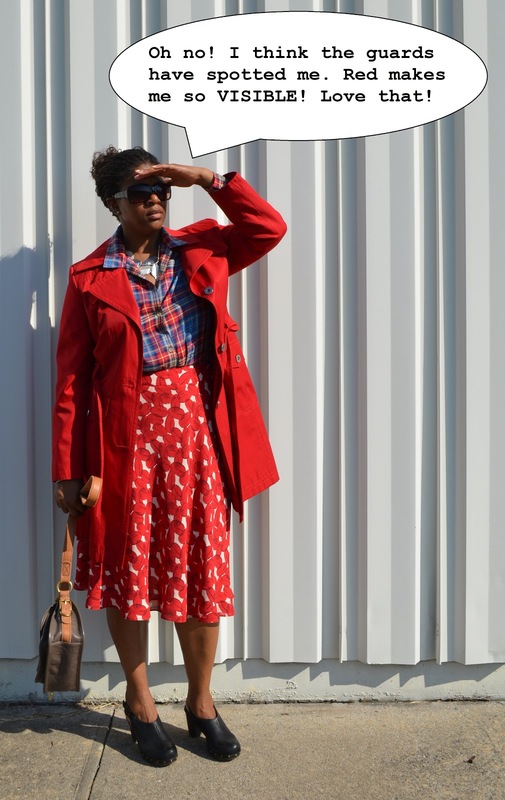 This sassy red trench's last appearance was back in February here. The skirt was last seen in action here, and the blouse here. If I'd been called upon to complete this mission just 5 short years ago, I wouldn't have been able to do it. I just absolutely did not wear red! I felt it wasn't my color, but I decided to give it a go one day and realized it suits me after all. I've been hooked ever since. Mixing prints has never been a problem though, I was doing that back in high school. My feelings are, as long as the colors coordinate, then it's ok to mix the prints. Easy! Have you ever become fixated with a color or particular pieces of clothing in your closet and you just wear them to death for about a month? I'm obviously going through a red phase. I believe it all started with the acquisition of this red dress. For some reason I've also been obsessed with this skirt and plaid blouse. I've worked out at least three other ways to wear them together. 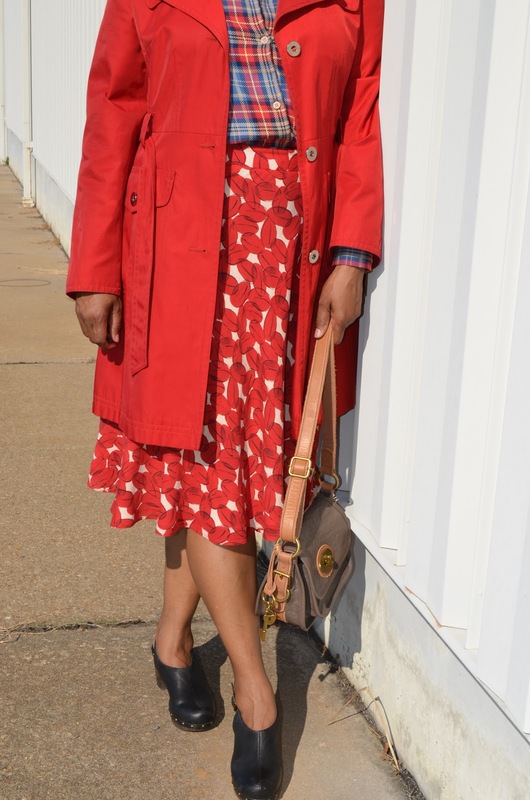 There's nothing like a comfy shoes, easy fitting skirt and blouse and a trench in a fun color to get a lady through the day's missions. 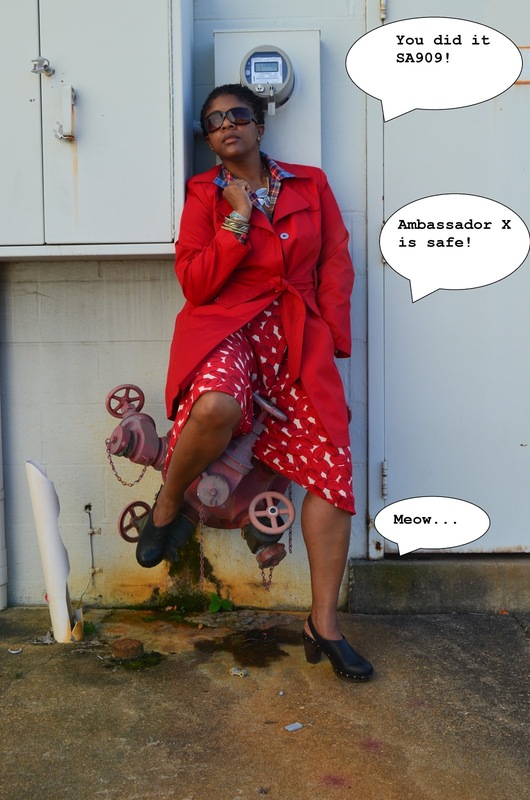 Ambassador X is safe, her thrifting powers have been fully restored. The thrifting community can breath a sigh of relief. Unfortunately, in the fray Rupert Retail escaped. No worries though, he can't run forever. Sooner or later, he'll end up in a thrift store or yard sale and I'll nab him! October isn't over yet and neither is my red phase. What are you fixated with this month, a purse, an accessory, a piece of jewelry? Hope you're indulging some of your own obsessions as well. I'll be linking up at Monday Mingle and Patti's Visible Monday. Until we meet again, live long, thrift, wear red and prosper. Popular Posts as Chosen by You! Western Glam: Where Have All the Cowboys Gone? Hi. My name is Sheila. I'm a recent transplant from Southern Cali to Virginia. Why and how did that come about? Well, it's a long and amusing story with a happily ever after. But let me sum it up for you in one word: Love. One thing I didn't leave behind in California is my love of thrifting. 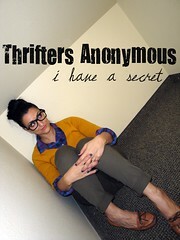 I'm a thrifter of the truest kind. I'm a master at it! Been doing it all my life and loving it! I also love a good yard sale and I'm no stranger to the clearance rack. Are you a like minded soul? Let's connect!